Inge Hardison, sculptor, actor and photographer celebrated her 100th birthday on February 3, 2014. 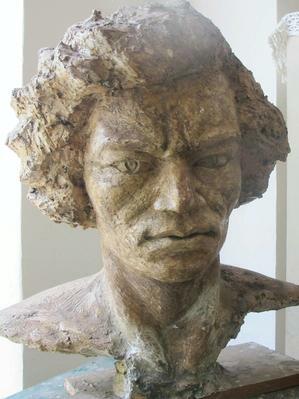 She is best known for a series of bronze busts, begun in 1963, of African Americans who fought slavery and led the struggle for civil rights, and who at that time had not yet been acknowledged in the National Hall of Fame in Washington, DC: Frederick Douglass, Sojourner Truth, Harriet Tubman, Dr. Martin Luther King. One sees palpably in her work her great respect for those who helped change history, as in her series, “Ingenious Americans,” which includes Benjamin Banneker (1731-1806) surveyor, clock-maker, mathematician; and Garrett Morgan (1877-1963), inventor of early traffic lights and gas masks. She also sculpted large public works: a life-size bronze, Mother and Child (her gift to Mt. Sinai Hospital in Manhattan after the birth of her daughter), and abstract figures such as “Jubilee” at Medgar Evers College in Brooklyn. Whenever we do something, we show what we are and also what we want…. [I]n the same way as it is necessary sometimes to stir things to do a better job of cooking, so it is necessary to have ourselves stirred—because we have to be impressed before we can express ourselves. Inge Hardison’s contributions to the arts have an energy that is big, thoughtful, and stirring. She was born Ruth Inge in Portmouth, Virginia in 1914. Soon after her birth, her parents fled Jim Crow racism and segregation, settling in Brooklyn. After graduating from high school, she landed the role of “Topsy,” the enslaved child in the 1936 Broadway production of “Sweet River,” George Abbott’s adaptation of Uncle Tom’s Cabin. Her portrayal of the slave girl whose brutal treatment doesn’t kill her wit and kindness won her rave reviews. She also appeared in “The Country Wife” with Ruth Gordon, and in the 1946 production of “Anna Lucasta,” co-starring with Ossie Davis and Ruby Dee. In the midst of all this, Inge Hardison discovered clay and was swept by the beauty and power of this material coming from the earth and, with it, her own ability and passion to express herself in this art form. It changed her life. While performing in another play, “What a Life,” she sculpted the heads of the cast members and the works were exhibited in the Mansfield Theater lobby. In 1942 she studied at Vassar, majoring in music and creative writing. There she also gave a song recital and her lyric soprano voice and expressive power was highly praised. I learned of Inge Hardison and met her in 2013 while doing research for “The Force of Ethics in Civil Rights,” my oral history project of videotaped interviews with unsung pioneers across the country. The research centered on the very little known history of how Jewish refugee scholars, attempting to flee the Nazi Holocaust in the 1930s-40s, were given jobs and safe haven by black colleges in the South—to the benefit of all. Hampton Institute (now University) employed one of these refugee scholars, Viktor Lowenfeld from 1939-46. He established the art department and urged his students to “let expression spring from your environment.” Hardison was associated with Lowenfeld and, through this association, she taught at Hampton Institute from 1944 to 1945 or ‘46. And so opened a new chapter in the relation of impression and expression in the life of an important American artist whose life I look forward to learning more about and documenting.